"An engaging memoir of travel, love, and finding oneself." -- Kirkus Reviews Newly recovered from a quarter-life meltdown, Clara Bensen decided to test her comeback by signing up for an online dating account. She never expected to meet Jeff, a wildly energetic university professor with a reputation for bucking convention. They barely know each other's last names when they agree to set out on a risky travel experiment spanning eight countries and three weeks. The catch? No hotel reservations, no plans, and best of all, no baggage. No Baggage is at once a romance, a travelogue, and a bright modern take on the age-old questions: How do you find the courage to explore beyond your comfort zone? Can you love someone without the need for labels or commitment? Is it possible to truly leave your baggage behind? Clara Bensen is a writer living in Austin, Texas. The story of her luggage-less trip began as a Salon.com article entitled, The Craziest OKCupid Date Ever,” and attracted international attention. 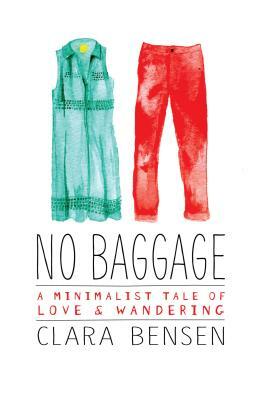 No Baggage is her first book. "An excellent way to cure wanderlust... Fun, warm, and a little bit dangerous, this true-life rom com is a must read for those that love getting their passport stamped." "Readers intrigued as much by modern romance as by world travel will appreciate this thrilling travelogue of an erratic relationship and the landscape of ancient and modern Europe." "Bensen's story of an unexpectedand at times magicalromance that developed from a chance online encounter is charming. Yet it is also insightful for the author's observations about the conflicting desires for freedom and commitment that are the hallmarks of modern romance. An engaging memoir of travel, love, and finding oneself."